IT would be hard to find a more current commercial pedigree than the one owned by Danehill (USA) grandson Magnus, who stands at Eliza Park International in Victoria (in conjunction with Yallambee Stud). The handsome son of Flying Spur, who was bred and raced by Robert and Yvonne Crabtree, is a Gr.1 winner and half-brother to Helsinge, dam of wonder mare Black Caviar (25 wins, 15 Gr.1, unbeaten) and four-time Gr.1 winner All Too Hard, himself by a son of Flying Spur. Syndicators BC3 Thoroughbreds thought so much of this family that they were prepared to bid $5m at Easter to secure the Redoute’s Choice-Helsinge (Desert Sun) colt, an Australian record price for a yearling and the equal highest price paid for a horse at auction here (with broodmare Milanova, sold in 2008), after bidding $2.6m for his sister (Belle Couture) at the same sale the previous year. This is a family though that has been producing high class runners here since the importation of the Danish Oaks-LR winner Love Song (DEN) (Warpath-Folk Song by Tudor Melody) more than 30 years ago. Love Song is the third dam of Magnus (ex Scandinavia by Snippets), a horse who was in the first four in 18 of his 24 starts and capped his career with a record-breaking win in the AJC The Galaxy-Gr.1 at Warwick Farm in 2007. He ran an 1100m track record of 1:03.26 in the process, a great feat as he was racing on a dead track and in driving rain and beating Fast ‘n’ Famous by a short neck in a field that included previous Galaxy winner Spark of Life and Bentley Biscuit. Magnus showed his class on the international stage too with a second in the KrisFlyer Sprint-Gr.1 in Singapore (behind champion Takeover Target) and a two-length third behind Miss Andretti in the King’s Stand Stakes-Gr.2 at Royal Ascot for trainer Peter Moody, after hitting the lead in the final furlong. He always took on the best sprinters in the land and his four wins also included the 2006 VRC Age Classic (Linlithgow Stakes)-Gr.2 (1200m in 1:08.90), beating Undue. Magnus defeated another smart one in California Dane in his maiden win (1010m) on debut at Werribee on October 8, 2005 and also won second time out, over 1100m at Rosehill, the following February. He was placed several times at the highest level and was runner-up in the VRC Newmarket-Gr.1 (to Weekend Hussler), Lightning Stakes-Gr.1 (to Miss Andretti in track record time, beaten 1.5 lengths) and second (to Weekend Hussler in 2008) and third (half-length behind Undue in 2007) in the Oakleigh Plate-Gr.1. He was also fourth in the Newmarket-Gr.1 (half length behind Miss Andretti), AJC The Galaxy-Gr.1 and T.J. Smith-Gr.1. He was also second in the AJC The Shorts-Gr.3 (1100m) behind multiple Gr.1 winner Bentley Biscuit and with Spark of Life third, and second in the Caulfield Sprint-Gr.2 (1100m) behind Biscayne Bay. Timeform awarded him an annual rating of 122 in Racehorses of 2007 and noted he was a “strong horse” and a “very smart performer” who was “effective at 5f/6f, acts on soft and good to firm going”. A sprinter pure and simple, Magnus has proved extremely popular since retiring to stud in 2008 covering a first book of 117 ($27,500) and then books of 166, 121, 121 and 79 (in 2012 at $17,600) and this season is on $13,200. His runners improve with age and although he was a prominent first season sire finishing fifth behind another Flying Spur son in Casino Prince with five winners of $318,475 in 2011-12, his three year-olds really got going last season. He was third behind Casino Prince and Hard Spun (USA) on the second crop list with 36 winners (57 wins) of $1,775,490. In fact Magnus has had 57 runners from that first crop (now four; 82 foals) for 40 winners (72 wins), three of them stakes winners, Platinum Kingdom (Giant’s Causeway), Missy Cummings (Serheed) and Prettyhappyaboutit (Peaks and Valleys) and the stakes placed runners Magnus Reign (Danehill), How Swede It is (General Nediym) and Imprimis (Rory’s Jester). The death of four year-old Platinum Kingdom in September was a real blow to connections as he’d won nine races and $270,000, firstly in NZ (CJC Champagne Stakes-LR, Dunedin Guineas-LR) and then in Australia, where his best win came in the BRC Classic (Fred Best Classic)-Gr.3 (1350m) at Doomben in May and he was also successful in the Listed South Pacific Classic (1400m) at Randwick for trainer Lisa Latta. He had quite an interesting pedigree with three lines of Northern Dancer (5mx5m,4m), a double of His Majesty (5fx5f) and Mr. Prospector (4fx3f) in five generations. His grandsire Flying Spur (Northern Dancer/His Majesty/Mr. Prospector) and second dam Go For It Lady (Mr. Prospector/Northern Dancer/His Majesty) are bred on a reverse cross. Missy Cummings carries doubles of Northern Dancer (5mx4m) and Raise a Native (5mx4f), while Prettyhappyaboutit has Northern Dancer 5mx5m and Mr. Prospector 4fx4m. Stakes placed Magnus Reign is inbred to Danehill (3mx2f) and Vain (4fx3f), How Swede It Is has Northern Dancer 5mx5m, and Imprimis has a double of Wilkes (FR) (5mx5f). So far Magnus had had just two named foals from daughters of Bel Esprit, for one winner, but given the success of Black Caviar (Bel Esprit) and the fact that Magnus already has black type performers who double Vain (dam sire of Bel Esprit) and his sire Wilkes, this could be a match worth repeating, especially as Magnus has also shown a liking for mares carrying Nijinsky (grandsire of Bel Esprit) and his close relative Storm Bird. Magnus also has two winners from four named foals out of daughters of Flying Spur’s family member Encosta de Lago (both trace to Northern Dancer’s great daughter Fanfreluche), but this could be another coupling to persevere with. The most popular matings by numbers of named foals to date are with daughters of Kenny’s Best Pal (five named, five runners, four winners) and Zabeel (five named, three runners, three winners), as one is from a mare by Sir Tristram and the other by Sir Tristam himself, these matings give at least one duplication of Sir Ivor (via a daughter and son). There have also been plenty of successful recent runners by other sires whose pedigrees feature duplications of Snippets (and his dam Easy Date) along with his sire Lunchtime. So far Magnus has only had one named foal out of a daughter of Snippets, but it was a winning combination and is worth trying again. Arrowfield’s Golden Slipper winner Flying Spur, who also counted the Australian Guineas-Gr.1 and All-Aged Stakes-Gr.1 among his six wins and was also twice second and twice third at Gr.1 level, began his stud career in 1996 and also shuttled briefly to Ireland. He met with immediate success locally when he was Champion First Season Sire and was retired from active stud duty in 2012 having left more than 1700 live foals. He was Champion Australian Sire by earnings in 2006-07 and twice led the sires’ table by winners (his stock have won 2874 races). To early September he had 883 winners (66.6% of starters) of $112m ($21m of that from his 40 winners from 60 runners in Hong Kong and $20m from his runners in the northern hemisphere), and his 89 stakes winners (6.7% of starters) include 11 Gr.1 winners led by $2.1m earner Mentality (Quiet American, Princely Native), who won the Champagne, Randwick Guineas and George Main at Gr.1 level and the Golden Slipper-Gr.1 heroine Forensics (Dehere, Naturalism), who also landed Gr.1 wins in the Myer Classic and Queen of the Turf. Juanmo (Marauding, Nishapour) won two Gr.1 events at two and Alverta (Rahy, Shadeed) won eight races including the Coolmore Classic-Gr.1. Flying Spur’s boom young sire son Casino Prince (Last Tycoon, Kenmare) won the Chipping Norton-Gr.1 and is now one of the stars of the Vinery roster alongside his Gr.1-winning son All Too Hard. Inspiration (Last Tycoon, Lunchtime), who carries a similar cross to Casino Prince, won nine races in Hong Kong including the Hong Kong Sprint-Gr.1, Sleek Chassis (Kaapstad, Noble Bijou) won a Blue Diamond-Gr.1, San Luis (Without Fear, Pia Star) won the Manawatu Sires’ Produce-Gr.1 and went to stud in NZ, Dealer Principal (Marauding, Whiskey Road) won the Rosehill Guineas-Gr.1 and All Time High (Northern Spring, Landau) won the VATC 1000 Guineas-Gr.1. The average winning distance of his runners is 1443m. Flying Spur is one of five Golden Slipper winners by his sire, the nine-times Champion Australian Sire Danehill (USA) (Danzig-Razyana by His Majesty), a Gr.1 winner at 6f in England and a horse inbred 3mx3f to Natalma via that mare’s son Northern Dancer and daughter Spring Adieu. Natalma is a daughter of Native Dancer, the American champion and 1954 Horse of the Year who was undefeated in 21 of his 22 starts (his only defeat coming when unlucky second to Dark Star in the 1953 Kentucky Derby), and who is the grandsire of Mr. Prospector, another champion sire who features in Flying Spur’s pedigree as the sire of his dam Rolls (USA). She is a grandaughter of another Northern Dancer champion in Fanfreluche, an outstanding mare on the track and at stud in Canada and the US. Rolls is also familiar to Australian breeders as her daughter Shoal Creek (Star Way (GB)) is the dam of dual champion sire Encosta de Lago (by Fairy King (USA)), another son of Northern Dancer). Flying Spur’s daughters have already produced 578 winners of $46m, with 43 stakes winners, four of them at Gr.1 level including dual South African Gr.1 winner and now Newhaven Park, Boorowa-based stallion Delago Deluxe, a son of Encosta de Lago and therefore inbred to Rolls. The other Gr.1 winners are champion juvenile and Golden Slipper winner Sebring (More Than Ready), who made such a great start to his stud career with a strong first crop in 2012-13 for Widden Stud and the talented fillies, WA Derby winner Grand Journey (Good Journey (USA)) and Coolmore Stakes winner and Golden Slipper runner-up Headway (Charge Forward). Listed winner Astounded is also by Encosta de Lago and from a Flying Spur mare. Her second dam is by Marscay and quite a few of Flying Spur’s better runners (and those of his daughters) have Star Kingdom close up in their pedigrees. Although relatively quiet for a couple of generations before Magnus’s third dam Love Song came to Australia, this mare hails from a classic family developed by Lord Astor (and descending from his foundation mare Conjure, 1895 by Juggler). Despite these modest credentials until its most recent generations, the dams in each generation are by successful English classic sires, Tudor Melody, Big Game, Rockefella, Mieuxce, Blenheim and Solario. She was sired by grey Warpath, a stakeswinning son of Sovereign Path who was able to sire only 10 stakes winners in 19 years at stud. His best was Celio Rufo, whose five stakes wins included the Gran Premio d’Italia-Gr.1 and St Leger Italiano-Gr.1. Among his other stakes winners were Love Song and Scoop, winner of the Klampenbborg Dansk (Danish) Oaks-LR and Jagersro Svensk Swedishi Derby. Love Song also won the Dansk Oaks-LR and ran second in the Svenski Oaks-LR from 11 starts. Love Song is one of four winners of the seven foals to race of her dam Folk Song (Tudor Melody-Lynstead by Big Game), all in Scandinavia. Love Song is half-sister to minor stakes winners Prince Ted and Gurkha, but the closest relation of any real quality is the distantly related Last Fandango (a great-grandson of another half-sister), who won the Epsom Blue Riband Trial-Gr.3, ran second in the Irish 2000 Guineas-Gr.1, was placed in two other Group races and was a reasonable sire. The family (1p) traces to Love Song’s seventh dam, Pinprick (Torpoint-Third Trick by William the Third-Conjure), whose daughter Point Duty (Grand Parade) is the dam of Champion English Three Year-Old Filly Traffic Light (Solario), herself second dam of English Oaks winner Ambiguity (Big Game). Interestingly, Big Game and Blenheim are also the sires of Love Song’s second and fifth dams. Pinprick’s descendants include a legion of high class stakes winners and successful sires around the world including Amerigo, Horse Chestnut, Mount Hagen, Sodium, Hornbeam and What a Guest. Pinprick’s half-sister First Spear (Spearmint) won the Nassau Stakes and Park Hill Stakes and they are daughters of Third Trick, whose sister is Winkipop, a celebrated producer whose descendants include Court Martial (grandsire of Vain). Winkipop won the English 1000 Guineas and Coronation Stakes. A brother to this duo is Pilliwinkie who won the King Edward VII Stakes in England, while a half-sister is the Nassau Stakes winner Concertina (Sir Eager or Fiorentino). Love Song’s sixth dam is So Quick (Solario), a half-sister to the unbeaten (seven starts) Rous Memorial Stakes winner Mannamead (Manna), a leading sire in Hungary, while fifth dam Quixotic (Blenheim) is a half-sister to Light Velocity (Pharos), dam of the Nassau Stakes winner Jet Plane (Umidwar). Malcolm Moore Pty Ltd imported Love Song to Victoria in 1980. For the Commercial and Rural Estates Pty Ltd in Victoria, she bred four named foals by some of Australia’s most successful sires, three of them fillies. Two of those fillies became outstanding producers, Song of Norway (Vain) and Song of Kingston (Bletchingly). A grey foaled in 1982, Song of Norway, whose sire won a Golden Slipper and is considered one of the fastest sprinters ever produced in Australia (he also won a Caulfield Guineas, Craven A Stakes, Ascot Vale Stakes, Champagne Stakes and VRC Sires’ Produce), did not race but 11 of her 12 foals got to the track and all won. Four of them became stakes winners, Frosty the Snowman (Christmas Tree), Midnight Sun (Western Symphony), Russian Tea Room (Raise a Cup) and Scandinavia (Snippets). The last named, foaled in 1994, is the dam of Magnus and she won four races to 1200m (one at two), including the QTC Cup-Gr.2 and VATC Blue Diamond Prelude-Gr.3 (1000m on debut at two) and was runner-up in the Salinger-Gr.1 (to Flavour) and Goodwood-Gr.1 (to Spectrum) and third in the Newmarket-Gr.1 (to General Nediym) and Lightning-Gr.1 (to Isca), earning $430,000 and finishing in the first four in 13 of 17 starts. Scandinavia is the dam of 10 named foals and five are winners, the others including Gr.2 winner and Gr.1 fourth Wilander (Exceed and Excel) and the talented fillies Arctic Flight (Flying Spur), winner of four races to 1400m including the Scone Dark Jewel Classic-LR and last season’s smart juvenile Scandiva (Fastnet Rock), winner of the Magic Night Stakes-Gr.2 and runner-up in the AJC Sires’ Produce-Gr.1. Scandinavia is also dam of unraced Helsinge (dam of World Champion Sprinter Black Caviar and All Too Hard, winner of seven races and $2.2m), the placed filly Danavia (by Danehill, dam of stakes placed Iconic), the winner producer Baltics (Fusaichi Pegasus) and the gelding Ibsen (Bel Esprit, nine wins). She has a 2011 colt by Redoute’s Choice and is due to Fastnet Rock this season for breeder Rob Crabtree. 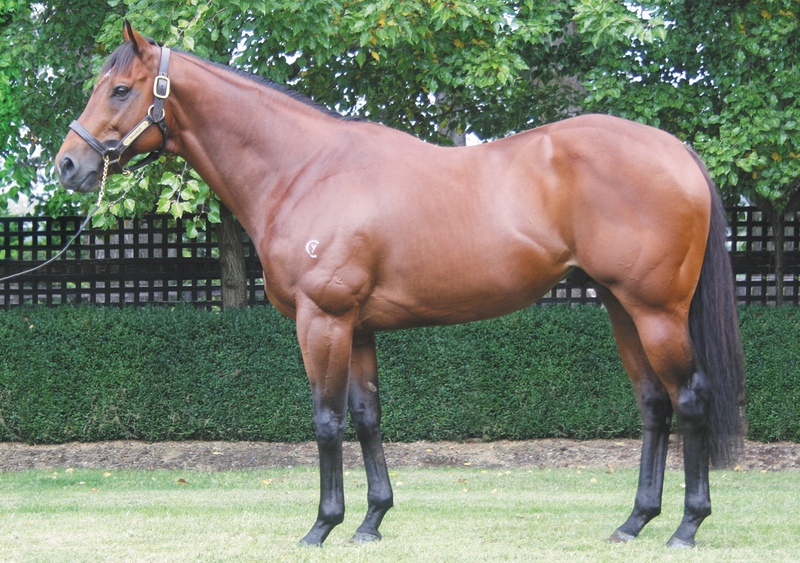 Scandinavia is by former Arrowfield sire Snippets (Lunchtime (GB)-Easy Date by Grand Chaudiere (CAN)), whose nine wins in 14 starts included the AJC Sires’ Produce-Gr.1 at two and the AJC The Galaxy-Gr.1 (1100m by 5.5 lengths) and Oakleigh Plate-Gr.1 (1100m) the following season when he was named Champion Three Year-Old Sprinter. His sire, the Widden-based Lunchtime (Silly Season-Great Occasion by Hornbeam) was an unbeaten two year-old in England and won the Dewhurst-Gr.1 and is a huge influence on modern Australian pedigrees, one example being as the dam sire of Canny Lad (himself dam sire of Redoute’s Choice). To mid-September daughters of Snippets had produced 869 winners (68.1% of starters) and 73 stakes winners (5.7%) including the Gr.1 winners Fiveandahalfstar (Hotel Grand), Red Tracer (Dane Shadow), Snitzel (Redoute’s Choice, inbred to Lunchtime), Bel Sprinter (Bel Esprit), Shellscrape (Dane Shadow), Crystal Lily (Stratum, inbred to Lunchtime), Overreach (Exceed and Excel (the last two Golden Slipper winners), Marju Snip (Marju), Unearthly (Zabeel), Wanted (Fastnet Rock), Romantic Touch (Northern Meteor) and of course Magnus. Pins, a Gr.1 winner by Snippets, is now a leading sire in NZ and his daughters could also prove an interesting cross with Magnus as could daughters of Zizou, the Fusaichi Pegasus son who stands at Turangga and is from the same female line as Snippets. Of course Golden Slipper hero Canny Lad, a horse bred on the Bletchingly-Lunchtime cross is another whose daughters should suit. Magnus offers plenty of scope for breeders as he’s a fast horse with a commercial pedigree and from a family that is continuing to deliver top class performers each season. Importantly, he’s getting plenty of winners too and his fee this season of $13,200 makes him look great value at Eliza Park International at Kerrie in Victoria.